This is actually a fairly old product. Not quite sure how old, but most likely to a time before any of us were shaving. I stumbled across this little package at my local pharmacy a few weeks back and decided to try it out. In fact they had conveniently placed the necessary tools together and I also picked up a shaving brush. Shaving soaps are somewhat of a older and different approach to shaving. First off, it is dirt cheap. 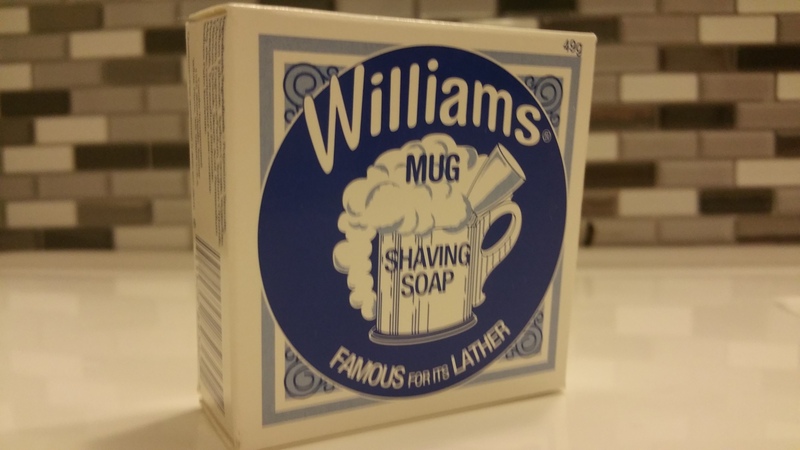 The Williams Mug soap was under $2. I was expecting the soap to be a bit greasier or fattier (if that is a word) than regular soap – basically, something to offer a glide and some protection during the shave. When adding hot water to my soap loaded mug, I started to stir it up with the brush and then onto the application. It covered my face well enough and I figured we were ready to shave. If anything it was a bit of a rough experience. Disappointing! My skin was raw from the blade. The soap foam offered next to no protection form the blade and gave very little glide. Now granted, I am usually using fancy shaving foams that go for 6 times the price of this soap. I guess I can say that you get what you pay for. It certainly was a cool experience and I am happy that I tried it, but this will not be my go to shaving solution.